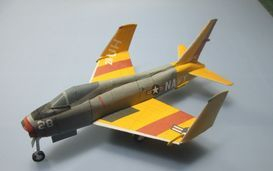 The North American FJ-4 Fury was a swept-wing carrier-capable fighter-bomber for the United States Navy and Marine Corps. 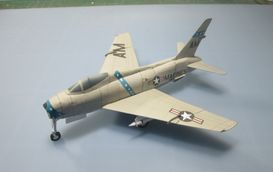 The final development in a lineage that included the Air Force's F-86 Sabre, the FJ-4 shared its general layout and engine with the earlier FJ-3, but featured an completely new wing design and was a vastly different design in its final embodiment. The FJ-4 was intended as an all-weather interceptor, a role that required considerable range on internal fuel. The FJ-4 had 50% more fuel capacity than the FJ-3 and was lightened by omitting armor and reducing ammunition capacity. The new wing was "wet"; that is, it provided for integral fuel tankage. 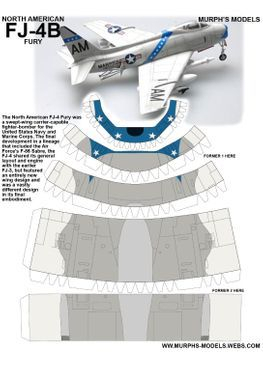 The fuselage was deepened to add more fuel, and had a distinctive "razorback" rear deck. A modified cockpit made the pilot more comfortable during the longer missions. The tail surfaces were also extensively modified and had a thinner profile. The overall changes resulted in an aircraft that had little in common with the earlier models, although a family resemblance was still present. The two prototypes had the same Wright J65-W-4 engine as the FJ-3, but production aircraft had the J65-W-16A of 7,700 lbf (34 kN) thrust. The first FJ-4 flew on 28 October 1954 and delivery began in February 1955. 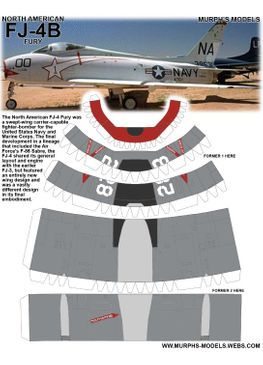 Of the original order for 221, the last 71 were modified in the FJ-4B fighter-bomber version. This had a stronger wing with six instead of four underwing stations and stronger landing gear. Additional aerodynamic brakes under the aft fuselage made landing safer by allowing pilots to use higher thrust settings, and were also useful for dive attacks. External load was doubled. But the most important characteristic of the FJ-4B was that it was capable of carrying a nuclear weapon on the inboard port station. It was equipped with the LABS or Low-Altitude Bombing System for the delivery of nuclear weapons. 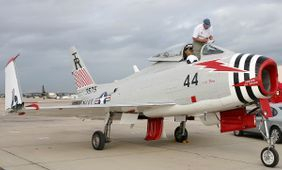 The Navy was eager to maintain a nuclear role in its rivalry with the Air Force, and it equipped 10 squadrons with the FJ-4B. It was also flown by three Marine squadrons. In April 1956 the Navy ordered 151 more FJ-4Bs, bringing the production to a total of 152 FJ-4s and 222 FJ-4Bs.